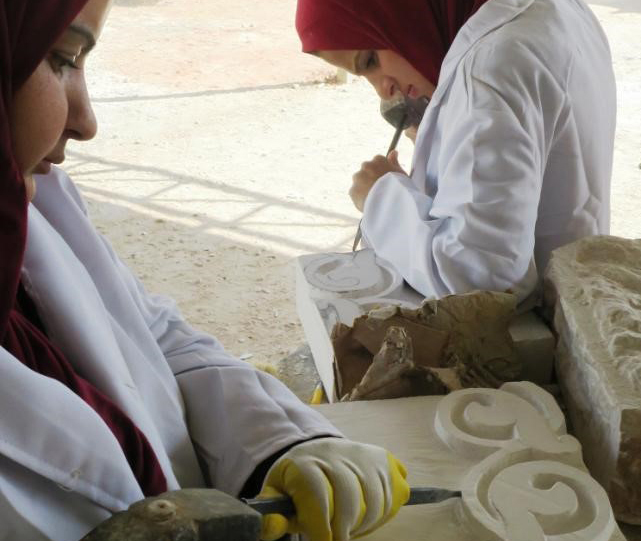 The project, sponsored by the British Council’s Cultural Protection Fund, has been live since September 2017 in Mafraq, Jordan – twelve miles from the Syrian border – working to provide a group of Syrian refugees and Jordanian citizens with traditional stonemasonry skills to become the craftspeople and conservators of the future; directly helping to repair conflict-affected heritage sites in the Middle East. The project was conceived with the intention of addressing three major issues; to provide support and practical training for refugees scattered across the Middle East, to increase the number of people in the region who have specialist skills which can be used during periods of conservation and reconstruction and, as an outcome, to preserve and protect the extraordinary monumental heritage of Iraq and Syria. The event will be an opportunity to take stock of the progress made so far as well as highlighting the project’s future ambitions; including short talks, videos of work to date and a Q&A with the team who join us in London from the Mafraq centre in Jordan.